1958. Penguin. ebook. 240 pages. Way back in July, Jenny of Reading the End, Ana of Things Mean a Lot and Simon of Stuck in a Book hosted a Shirley Jackson Reading Week. I started reading The Sundial during that week but finished the book several days after the event had ended, and then never got around to reviewing it on my blog. My negligence aside, it seems appropriate to review The Sundial on Halloween. It is after all about visions, messages from beyond the grave, and the end of the world. Or is it? 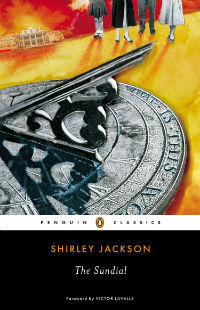 The Sundial is one of those books where it’s unclear how much is characters’ delusion and how much is real. The book opens as the Halloran family returns to the extravagant familial mansion after the funeral of the heir. The heir’s widow believes that her husband was pushed down the stairs by his own mother, the elder Mrs. Halloran. As we get to know all of the characters, that does not seem out of the question.The elder Mrs. Halloran is a practical, cold woman. In the wake of the funeral, assured that the estate is now hers, Mrs. Halloran announces her plans to evict or otherwise sideline various relatives and hangers-on who currently reside in the house. Her sister-in-law, Aunt Fanny, soon begins to experience visions and proclaims that her late father has delivered a warning: those who stay in the house will be saved from an imminent apocalypse. Mrs. Halloran decides to believe this warning and assumes control over the preparations. And so begins a strange but entertaining tale of how this dysfunctional group of people spend their time waiting for the end of the world. The Sundial is often a very funny book. At one point, another doomsday group – the Society of True Believers – is received into the house, and the two groups compare notes. Mrs. Halloran is not impressed by them, and her condescension toward this other doomsday group is hilarious and absurd. She also can deliver a good set-down. The Sundial would also be great fodder for literary analysis and I mean that in the best way. There’s so much thematic material to dig into, as the characters prepare for the end of the world under the sway of the domineering Mrs. Halloran. Perhaps the most striking passages are the conversations between one of the young women in the house, Gloria, and the only child in the house, Fancy. I think they want the same things you do, only you would . . . inherit them, so to speak, just by growing up. Things like excitement, and new experiences, and all kinds of strange and wonderful things happening; you get them anyway, just by the process of growing older, but for them . . . they’ve already outgrown all they know and they want to try it all over again. Even at my age, you keep thinking you’ve missed so much, and you get older all the time. 2014. Vintage. ebook. 401 pages. A number of my co-workers read Kristof and WuDunn’s book Half the Sky: Turning Oppression into Opportunity for Women Worldwide. I didn’t get around to reading it, but I saw Kristof and WuDunn’s talk at the National Book Festival and decided to read their newest book, A Path Appears. To broadly summarize, A Path Appears is about people trying to make the world a better place. 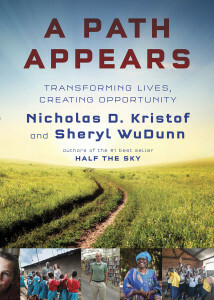 Kristof and WuDunn decided to focus on “expanding opportunity worldwide, because talent is universal, but opportunity is not.” The book is intended to encourage the reader to take action in improving the world. A Path Appears is divided into three parts: “Giving Opportunity Wings”; “Reforming the Art of Helping”; “Give, Get, Live”. To be honest, I didn’t find the organization or flow of the book to be all that coherent, but there were a lot of good ideas and interesting social programs and charities highlighted. I was most engaged in the first part of the book which discusses evidence of what really works to change lives, and the social programs that are bringing about that change. The authors strongly emphasize how important it is to intervene in the first few years of a child’s life, as that is a crucial time for their development. Programs which stood out to me were: the Nurse-Family Partnership which connects nurses to at-risk expectant and new mothers and Reach out and Read, a program where families with young children receive books through their physician’s office. I was also impressed with the description of Youth Villages‘ impact. I also appreciated that Kristof and WuDunn addressed “Americans [who] worry that donations accomplish nothing because people are poor as a result of self-destructive behaviors, from substance abuse to laziness.” The authors acknowledge that poverty can engender self-destructive patterns: “In part they arise because life in an impoverished village or slum is dreary, tedious, and depressing.” In addition, “when people spend their days fretting about eviction, electricity cut-offs, bills, and jobs, they’re biologically less able to exert self-control.” Kristof and WuDunn argue that the way to help break this cycle is to offer a ray of hope, and they provide multiple examples and research studies that show positive change from providing opportunities. In the second section of the book, the authors turn their attention to the assessment of charitable programs. They criticize excessive focus on overhead costs and salaries of non-profit leaders, which can lead to charities cutting corners and to an inability to attract skilled professionals. … what truly matters is not overhead but impact. There’s no point in funding an AIDS vaccine effort that saves on overhead by using unreliable third-rate laboratory equipment. WuDunn and Kristof also advocate for greater partnerships between religious and secular charities, nonprofits and corporations so that they can combine their strength in addressing common causes. The authors point out that “everyone wants to start something new, not join an existing program . . . The last thing the world needs, we believe, is one more aid group on top of the 1.4 million already operating in America.” However, throughout the book, the authors include stories of people who recently founded new programs. There isn’t anything necessarily wrong with those particular programs, but I wish that Kristof and WuDunn had included more stories of people who did join existing programs and changed the world that way. The other problem I had was that it seemed that so many of the narratives centered on individuals who left highly successful careers or attended top-rated universities, but gave up more lucrative pursuits to found non-profits. That’s all very noble and good, but the repetition of this narrative type started to grate, as it can come across as an implication that we should more greatly admire the charitable work of these people because they gave up a privileged career trajectory. These stories probably won’t strike other readers the same way, and I may not have had this reaction if I hadn’t seen this narrative arc employed elsewhere. I appreciated the authors’ reminders that “helping people is a fraught, uncertain process that is never as easy as fund-raising appeals suggest” and also: “We yearn for the alchemy of an overnight success, but that’s not the usual paradigm; even the most important transformations are often plodding.” The book concludes with practical starting points for getting involved whether it’s through financial giving, volunteering or advocacy.